While owners of the HTC Hero and Samsung Moment had hoped that their respective devices would be running Android 2.1 by now, it appears that the carrier is still having some issues as it continues working with HTC and Samsung on the upgrade. 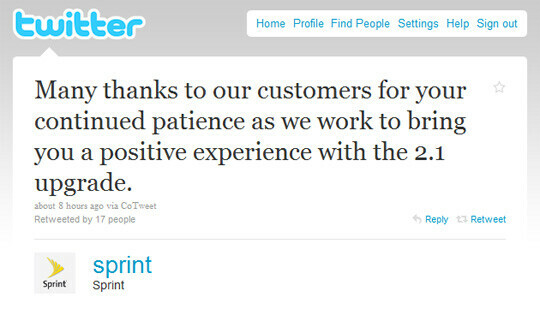 In a tweet sent out today by Sprint, the carrier thanked its customers for continuing to have patience as they all work on bringing a positive experience with the Android 2.1 upgrade. Some of the issues involve Sprint's inability to offer the update to customers OTA. Instead, as we previously reported, Android 2.1 will apparently be delivered via wire with a strong possibility that each Hero and Moment will need to get wiped before receiving it. Using a PC to upgrade a phone usually ends up with many users deciding not to bother with it. For example, Android and Me learned that an amazing 90% of Samsung Moment handsets are not running the current software because the previous update also was done over the PC. Besides the tweet, the carrier also put out an official statement on forums which said, "We wanted to let you know that Sprint continues to work closely with Samsung and HTC to deliver the highly anticipated Android 2.1 upgrade for Samsung Moment and HTC Hero. We are on track for the upgrade to be available in Q2. Sprint had hoped to have this resolved by now – we thank our customers for their patience as we work to bring them a positive experience with this upgrade." It would seem that some Sprint customers still have patience to wait, while the others have the EVO 4G coming. Well I would expect it to be an over the wire upgrade as it's a pretty big update. It may have been an OTA if Sprint had kept up with the software incrementally (1.5-1.6 1.6-2.0 2.0-2.1 etc), but going from 1.5 straight to 2.1... Anyway I would hope it wouldn't be a wipe but oh well. Sometimes an OTA update can be a complete wipe if you have an issue with the install!